You may have heard Fiesta San Antonio referred to as “A party with a purpose” and if you have ever been to Oyster Bake at St. Mary’s University, you know it’s a huge party with a great purpose. This year’s festival marks the 100th anniversary of one of the biggest and best Fiesta events this city has to offer. The Fiesta Oyster Bake committee estimates 7,000 volunteers work over 50,000 hours to put on this 2 day event for 60,000+ attendees. Held the first Friday and Saturday of Fiesta every year, this year’s event was just as fun as it always is. The event boasts some of the best festival food and drinks along with various stages with bands playing tunes to suite almost any musical taste. This year, some of the headliners included rock band Chevelle, Texas country singer Kevin Fowler, and Tejano star Bobby Pulido. There was also a carnival on site that buzzed all day and night long. April in San Antonio usually means heat, humidity, and rain and it is looking to be no exception this year. There was a high chance of rain threatening the day but that didn’t stop the crowds from showing up and luckily for everyone, it didn’t end up raining at all. 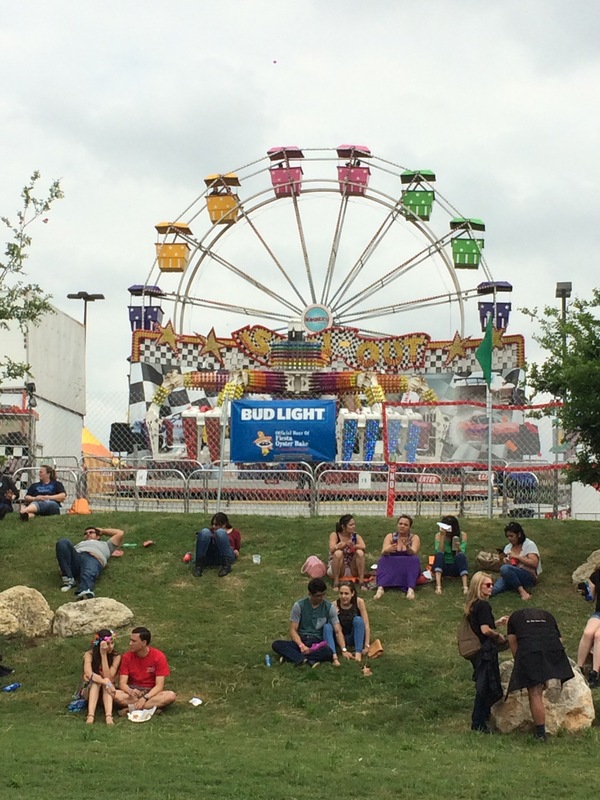 The Oyster Bake carnival is perfect for kids (and kids at heart) while others use the grassy area near by to take a break from the fun. In my experience attending Oyster Bake, I can say there are two types of people who attend: 1) Arrive early to enjoy no lines and the laid back atmosphere of the day 2) Arrive after 5pm, deal with the crowds and rock out to the headlining bands. I used to be a group #2 attendee but over the last few years I have converted and I am now a proud member of group #1. No matter which group you belong to, you will no doubt have a great time. 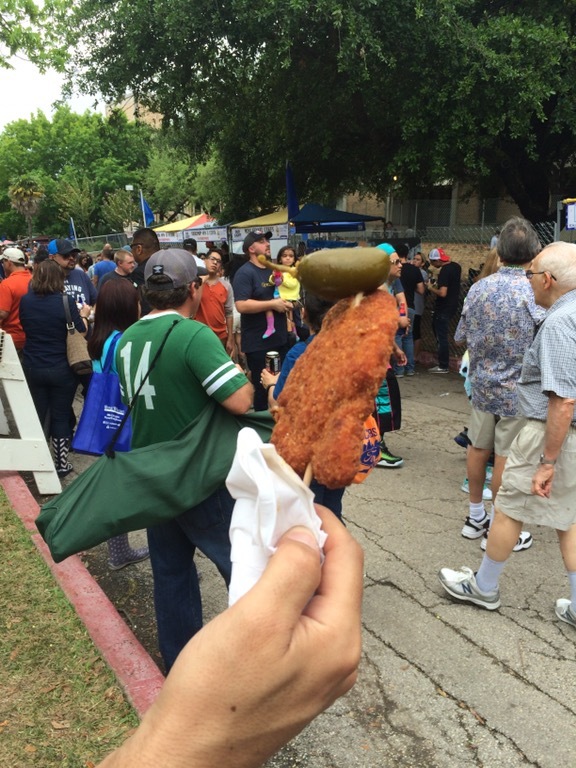 The infamous Chicken on a Stick. 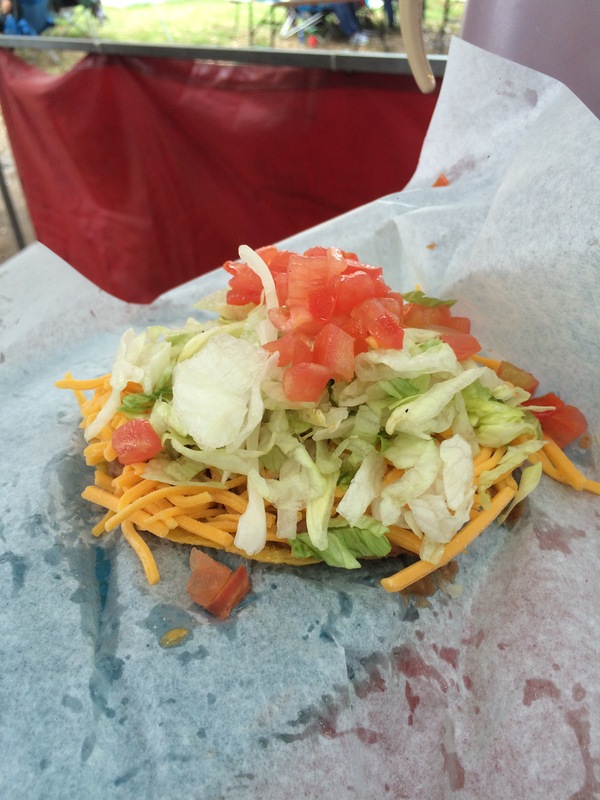 Food options at Oyster Bake vary widely. Of course, there are oysters! You can get them baked, fried, and as a shot (raw served in a little plastic cup). If you have never been to OB, as a first timer, you have to get the baked oysters just for the experience. After renting an oyster shucking knife, find a spot to crack open your oysters to enjoy. Don’t forget to find the oyster shell recycling station when you’re done! As an Oyster Bake veteran, I opt for the oyster shot. Less mess and easy to garnish with cocktail sauce, horse radish, lemon juice and Tabasco. Other food options include everything from fajita tacos and pizza to hamburgers and turkey legs. And there are so many options for food on a stick- shrimp, sausage, steak and of course chicken. I found out yesterday that not only can you order a chicken on a stick with a jalapeño, you can ask them to dip it in the jalapeño juice for a little extra zing! Pro-tip #2: If you’re planning to stay into the evening to watch the headlining bands, bring your lawn chairs and umbrellas to set up. Find a great spot for watching the shows and make it your home base for the day. Not only will you have an area to come back to through out the day for resting and cooling down from the heat, but you’ll have a great area for watching the headliners later in the evening. Don’t worry about leaving your chairs unattended while you walk around, they will be there when you come back- San Antonio is friendly like that! PS: no coolers are allowed. Be sure to put this event on your calendar for 2017…Happy Fiesta!